This morning my devotional was about the beauty that God has put all around us to remind of His glory and love. So many times we rush through life and don’t notice the beauty that surrounds us and I realized that though I have had more time in the past six months than I have in years, I still tend to get so involved in what’s going on that I miss the beauty. So, I decided to stop and notice. As I went through the shots I took this week I realized beauty comes in all forms, from an awesome sunset, to the young bud of a rose, to little feathered friends, the formations created by ice as it freezes, and even the perfect bubble of air in an ice-cube. “the whole earth is full of His glory”, as I contemplate that thought, things like a smile, laughter, the sound of rain and rolling thunder, the smell of lavender, the taste of chocolate, hugs and kisses, friendship, and many more come to mind. We are surrounded by beauty. Have you noticed the beauty around you? One of the daily prompts is “State of your year”. My year started out with a blessing and an answer to prayer after almost three years of knowing I was in the wrong place. I remember that day as if it happened yesterday. I was no longer employed but it was one of the happiest days I had experienced in quite a while. I was thanking the Lord as I walked to my car and if my arms hadn’t been full I would have had my hands raised in praise. I’m thankful for lessons taught and learned. So my year has been a restful blessing for me since January. Each day I start it with a Scriptural devotional and prayer time, then I read a chapter or more in my Bible. I have searched and applied for work every week, have been to several interviews and drew unemployment until it ran out. I have done all this with prayer and communication with my Heavenly Father and I have peace, about my lack of employment that surpasses understanding, trusting God. He has provided our needs thus far and I believe He will continue. In the meantime, I continue to search and patiently wait on Him to open a door. I don’t want to make the mistake I made with my last job, by jumping and accepting a job, just because it would be steady income. When I’m not searching for a job, I stay busy with promoting my Avon sales, sewing, quilting, watercolor painting, and reading inspirational fiction. Sometimes I will play a video game. This week I’ve been working on a small quilt that will go to our local community outreach service. Here are the two blocks that I’m going to use in it. They are both nine patch blocks. The traditional looking nine patch is a little wonky and they will all be that way just to give it a little quirkiness. I plan to border each block with a contrasting color. These two blocks are 8″ square and will be 12″ when I add the borders. My son, Joshua, was in for a short visit last weekend and if your children have left home, you know what a blessing it is when they come back for a visit. I have written before how my home is filled with music with my husband and both children playing guitar, bass, drums, and piano. If they aren’t all playing together, one of them will be playing something. I can’t imagine life without music. To sum my year up so far, again I’m thankful for lessons taught in my walk with God and what I’ve learned. I’m thankful for peace the surpasses understanding, for the family I was physically born into and married into. I’m thankful for my church and church family. I’m thankful for the freedom I have to share this with you. I’m thankful for you visiting and reading. That’s the state of my year. I got up this morning, started a load of laundry and looked at these two walls in my dining area. I’ve been thinking of changing them out for some time and decided this morning to go ahead and get it done. I’ve been collecting plates for some time. I see a pretty piece of China at a flea market or antique shop and if it is priced right, I buy it. Here are the ones I have collected with three from my own China set. I don’t profess to be an interior designer, but I like the change and plan to put some of the veggie stuff, I took down, in the kitchen area. In yesterday’s blog I mentioned spending some time in my sewing room. I did, but did not get any sewing done. Got caught up on my Armor of God study, which was my priority today, but overall I took it easy and stayed cool. I’m always amazed at how God lets me know I am never alone. I’ve just started a study on the Armor of God with Priscilla Shirer and have already been reminded of how He has been with me through the lows and highs in the past four years. He has never left me. I’ve also been reminded of how the enemy (satan) will set in place obstacles to blind our sight when it comes to our relationship with Jesus Christ. More than ever, it is imperative that we use the armor the Lord has given us to use against the enemy who is already defeated. And he only has power over us if we let him. We have power against the enemy through Jesus Christ. It is our responsibility to use that power in our daily life. Ephesians 6:13-18 New International Version (NIV) Therefore put on the full armor of God, so that when the day of evil comes, you may be able to stand your ground, and after you have done everything, to stand. Stand firm then, with the belt of truth buckled around your waist, with the breastplate of righteousness in place, and with your feet fitted with the readiness that comes from the gospel of peace. In addition to all this, take up the shield of faith, with which you can extinguish all the flaming arrows of the evil one. Take the helmet of salvation and the sword of the Spirit, which is the word of God. And pray in the Spirit on all occasions with all kinds of prayers and requests. With this in mind, be alert and always keep on praying for all the Lord’s people. After hearing this, I was compelled to write what I have learned in my walk with the Lord about scoffers. I believe every believer will face being scoffed or laughed at, at one time or another, if they are truly trusting and trying to live their life for God. My first thought went to Job. Remember how he suffered and was mocked? Or perhaps a scripture in the book of Psalms fits it better. I can only imagine what my friend felt at the moment upon hearing the laughter. I’m sure questions started going through their mind. Questions like “Are they laughing at me, questioning my faith?”, “Are they really that insensitive?”, or maybe “Are they that angry at God?”. My friend continued on their way after hearing that scoffing statement. It’s a natural instinct, for a lot of people, to turn around and tell the person laughing exactly what they think about their rude behavior. Then there are others who wouldn’t waste their breath on them again if they had too. Needless to say a scoffer does not make very many “brownie points” with people. So, how should we respond to scoffers? Psalm 1:1-4 (NIV) Blessed is the one who does not walk in step with the wicked or stand in the way that sinners take or sit in the company of mockers, but whose delight is in the law of the LORD, and who meditates on His law day and night. That person is like a tree planted by streams of water, which yields its fruit in season and whose leaf does not wither – whatever they do prospers. Not so the wicked! They are like chaff that the wind blows away. In 1 Peter it tells us to live good lives among the unbelievers. 1 Peter 2:15 (NIV) For it is God’s will that by doing good you should silence the ignorant talk of foolish people. 1 Peter 2:21-23 To this you were called, because Christ suffered for you, leaving you an example, that you should follow in His steps. “He committed no sin, and no deceit was found in His mouth.” When they hurled their insults at Him, He did not retaliate; when He suffered, He made no threats. Instead, he entrusted Himself to Him who judges justly. These verses tell me that we should “turn the other cheek” so to speak. Give it to God and carry on. Keep on living for God to the best of your ability, and last but not least, pray for the offender so that they might learn to walk in the light. Boy, the day has just flown by. 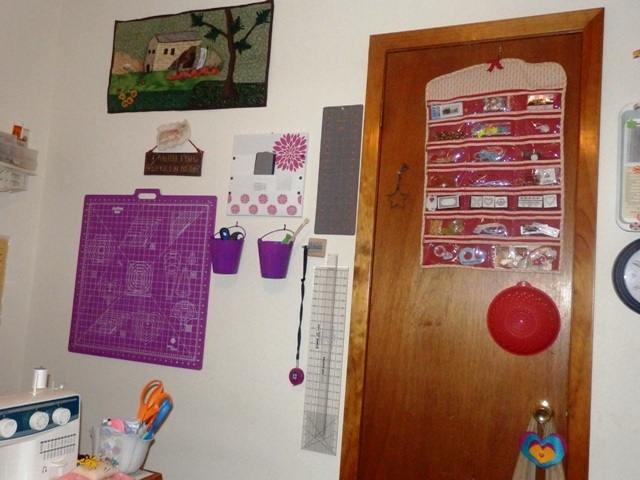 I was busy with homework this morning, then after lunch I did a little more organizing in my sewing room. I took things that were on my cutting table and made a place for them up on the wall for storage when not in use. 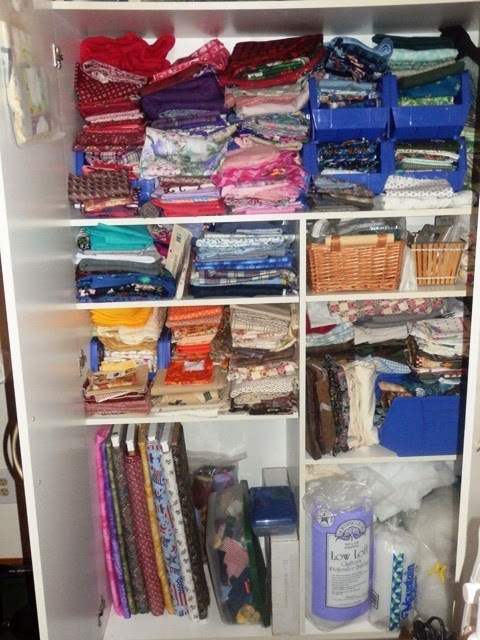 I organized my fabric cabinet, mostly the bottom section next to the batting. 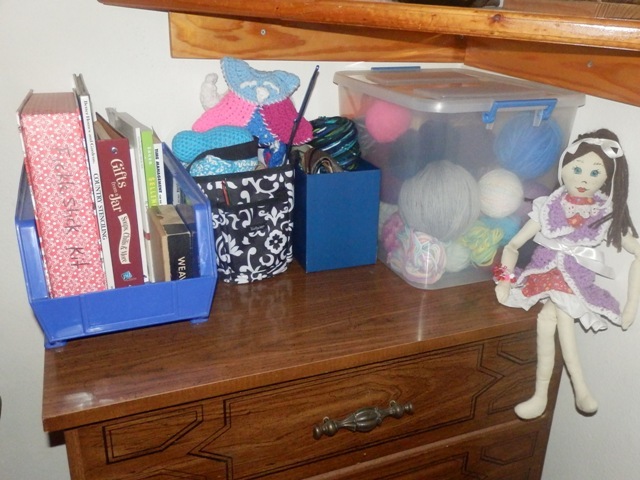 Then I worked on my crochet/yarn area. 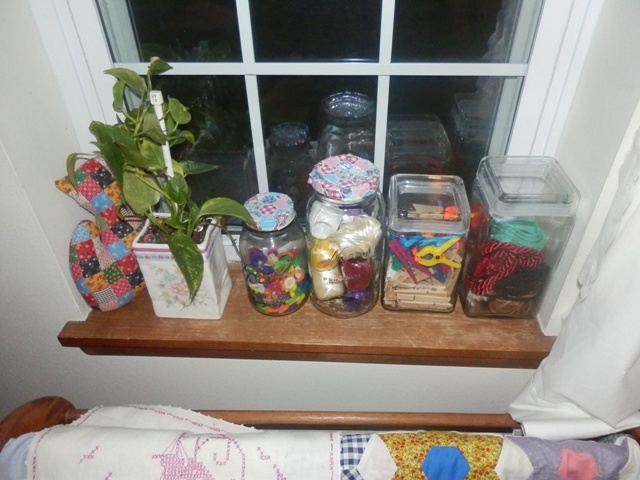 I was able to organize the top of this yard dresser by moving items to the window sill. Then I took a break and did my Bible study. I finished Romans and am now studying Acts. 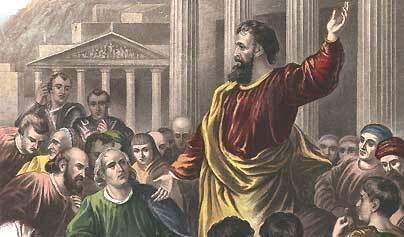 I got to tell you, the Apostle Peter sure could preach, not backing down from those who opposed what he was teaching. Okay, then I sat at my sewing machine. I finished the last “Gift Box” I needed for the quilt guild. 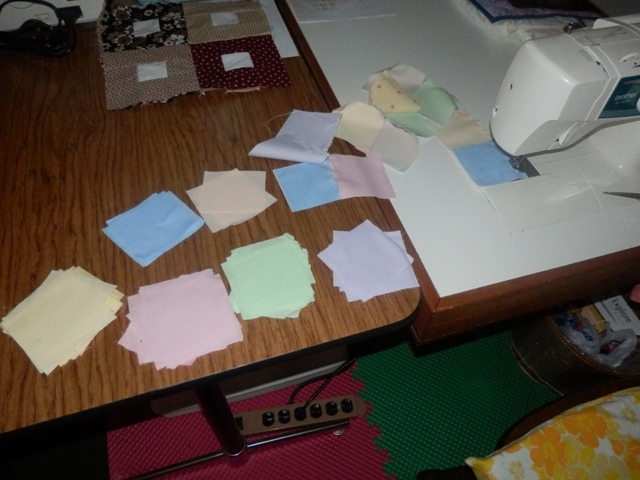 Then I started chain piecing some charm squares I found in my organizing endeavor earlier.